At Heritage Park, the Garden Management Committee is expanding the garden's collection of New Zealand hybrids, with emphasis on hybrids bred in the North Island. 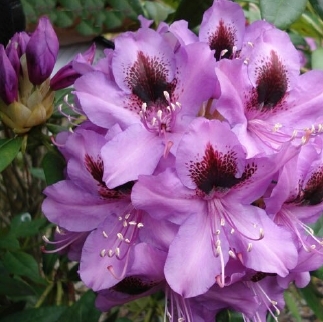 This initiative is part of the New Zealand Rhododendron Association's project aimed at conserving hybrids. In recent years the Committee has planted collections of Gordon family hybrids from Taihape and John White hybrids from Hawkes Bay. Interest has now turned towards the King family hy brids bred in Wanganui and we know that thirteen hybrids were registered by Stafford King in the 1980's. Six other unregistered King hybrids are known and there may be more in Wanganui gardens. Currently there are two King hybrids at Heritage Park, R. 'King's Milkmaid' and R. 'Bumblebee'. 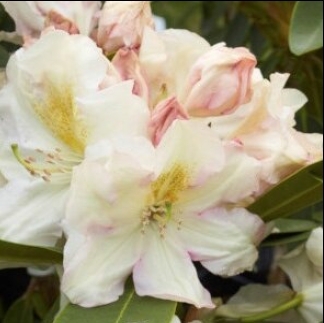 We will be able to acquire several more King hybrids from the nursery trade but to get a representative collection we will have to visit Wanganui gardens to get scions for propagation. Our search for King hybrids is being aided by Tom Carter who owns the Springvale Garden centre which is on the site of Stafford, King's former nursery. Visits will be made to Wanganui in October-November 2015 to look at the hybrids in flower, and then in late summer 2016 we hope to collect scions. Update on Cuttings taken from Tombleson Garden, "Tapuwae". 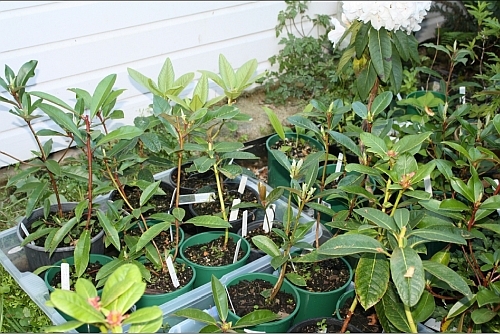 Plants were propagated on 28 February, 2014 and this is a recent photograph 21 months later. They have recently had new growth pinched out to encourage branching and have been re-potted. We hope to plant them out at Heritage Park in the autumn. Thank you to all who participated in working bees this year. We have achieved a lot, including moving large trial plants to new gardens. 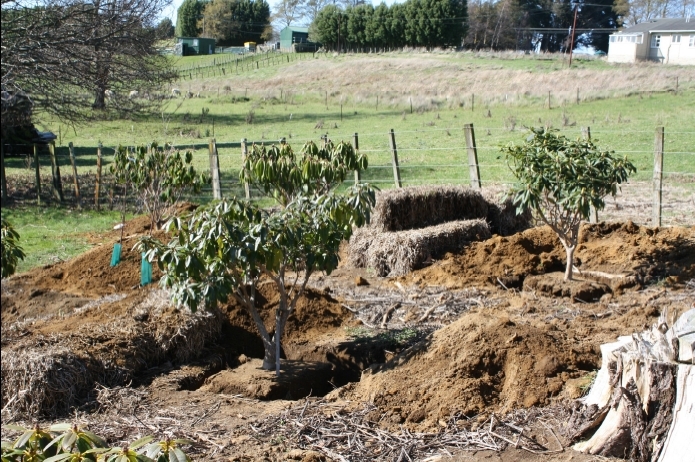 The photo depicts preparation work done by community workers, the plants in place after being moved by tractor and the pea straw waiting to be spread.